"...you should view the national anthem as a team activity," Kangadis said. "We're all supposed to be on the same team." 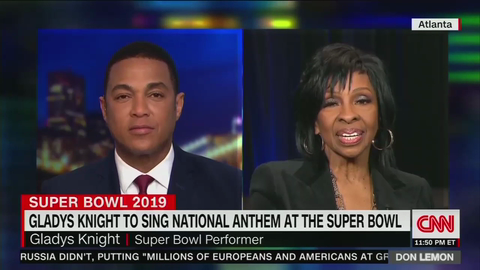 Legendary R&B singer Gladys Knight made the country’s goosebumps get goosebumps with her performance of the anthem. And since words alone fail to describe the utter beauty of the moment, here it is. Kinda renews your faith in humanity, doesn’t it? At least a little? “If I'm able to raise $5,000 for the Special Olympics Organization, Tom Ricketts will let me sing the National Anthem at a Cubs game," Stefan Xidas wrote. He ended up raising almost $20,000! The goalpost continues to move on a national anthem policy for the NFL. Commentator and political “activist” Jemele Hill is out at ESPN, according to the New York Post and a tweet from author James Miller. In a bid to stay relevant, Hillary Clinton took to Twitter on Wednesday to praise an 11-year-old girl for kneeling during the Pledge of Allegiance at her middle school. “This is a league that punishes players for writing on their cleats, and they’re not going to punish players who won’t stand for the national anthem?” BCPBA Vice President Rod Skirvin said. Multiple players from a few different teams protested on Thursday night during week one of the NFL preseason schedule. Posters around the restaurant indicate that the West’s Beef O’Brady location will offer military veterans 40 percent off on food on Sundays instead. League and team policies regarding conduct during the playing of the national anthem will not be issued or enforced for several weeks. "Our union filed its non-injury grievance today on behalf of all players challenging the NFL's recently imposed anthem policy."